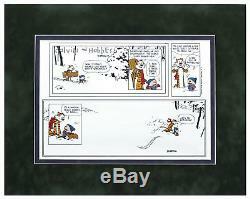 Bill Watterson signed color proof of his final''Calvin & Hobbes'' comic strip, published 31 December 1995. In this last Sunday strip, the famous best friends explore a new world, covered with snow, representing a blank slate of a New Year and perhaps a new life post-comic strip. Watterson directed the distributor of his comic, Universal Press Syndicate, to print up several color proofs of this last iconic strip to be sent out to art directors and editors at newspapers across the U. As a''thank you'' for their support of Calvin & Hobbes. Included is the letter to the recipient of the strip sent by Lee Salem, the United Press Syndicate VP and editorial director. In addition to discovering Watterson, Salem also edited Garry Trudeau's''Doonesbury''. Proof measures 13.75'' x 9.75'', double-matted in green suede to 19'' x 15''. The item "Final Calvin & Hobbes Proof Signed by Bill Watterson" is in sale since Thursday, November 8, 2018. This item is in the category "Collectibles\Comics\Original Comic Art\Comic Strip Art". The seller is "n8sautographs" and is located in Los Angeles, California. This item can be shipped worldwide.